I was surprised that Robert F. Kennedy (at right) was the most tempting celebrity hook in coverage of the most recent civil disobedience outside the White House. About 50 people handcuffed themselves to the gates out front and were arrested, and the story generated international attention. The protestors, including Bill McKibben (350.0rg), Julian Bond (NAACP), actress Daryl Hannah (who probably would have been in most of the photos years ago), and Michael Brune of the Sierra Club. The cause is the still unresolved status of the proposed Keystone XL pipeline, which will carry heavy crude oil from the Tar Sands in Alberta, Canada, to refineries on the Gulf Coast, where it can be processed, then transported, sold, and burned around the country. Jim Hansen, the NASA scientist who has been sounding the climate alarm for decades, was arrested as well–but he decided several years ago that he needed to add civil disobedience to all else he was doing to address climate change. None of these people is getting arrested instead of taking other action on climate change. Hansen has been writing academic papers and giving speeches and testimony, for example, while McKibben has been organizing groups, campaigns, and writing thoughtful and elegant books. And Robert Kennedy Jr. has been working as an attorney for the National Resources Defense Council, seriously engaged with environmental issues for more than twenty years. So, why spend a cold morning putting on handcuffs, only to have Washington police cut them off and replace them with a pair of their own? It’s a mistake to think that this Keystone protest, one among many, will provide the critical moment that will change policy. Instead, civil disobedience is a way to put climate change back on the political agenda in Washington (which is crowded with discussion of guns, immigration, jobs, and sequester, sequester, sequester). The arrest, and Daryl Hannah helps here, is a way to get attention that yet another scientific paper or policy proposal will not. But civil disobedience is effective only to the extent that it mobilizes others to take a range of additional actions. Historically, the environmental movement has been predominantly white and middle-class (and up). 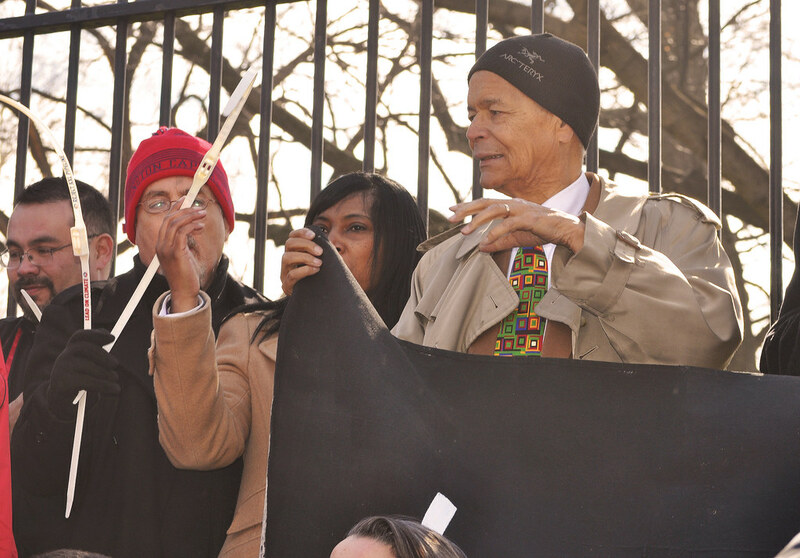 Julian Bond (left), long ago the Communications Director of the Student Non-Violent Coordinating Committee, is no stranger to civil disobedience. Most recently he was the longtime chairman of the NAACP. Bond’ s presence represents an attempt to broaden and diversify the coalition of people active on climate change. Michael Brune, the Executive Director of the Sierra Club, had his participation and possible arrest authorized in advance by his Board. This is news because it’s the first time in the Club’s 120 year history that the group has participated in civil disobedience. Why now? Perhaps, as for Jim Hansen, the problem of climate change is so critical and the progress so slow, that dramatic action became more attractive. There’s something else as well: choreographed arrests at the White House gates is now hardly so disruptive or alienating to potential supporters as it once may have seemed. We watch now to see whether the action will affect the people who work inside the White House, or, more likely, whether the stories inspire people who see the pictures and read online, to do something else. This entry was posted in Uncategorized and tagged 350.org, Bill McKibben, celebrity, civil disobedience, Daryl Hannah, Michael Brune, NAACP, Robert F. Kennedy, Sierra Club, SNCC. Bookmark the permalink.